The weather has been a bit strange all over the country this spring. One day I am bbqing, the next I am making soup to help warm up my bones. Today it was warm, sunny, and beautiful. Perfect for a cool summer type salad. And many times I look at what I have in the fridge and just get creative. This I must admit was inspired by a fantastic meal at Cafe Jerusalem on Evergreen street in downtown Vancouver. While eating that amazing meal of Lamb Shawarma, tabouli salad, hummus, and pita, I pondered the ingredients in my fridge, as I often do. You may be thinking I should be enjoying the moment, but believe me I was in the moment devouring that lamb. That may have been the best plate of middle eastern food I have ever enjoyed! SO GOOD!!!! 1. Mix vinegar, oil, pepper, and salt in a large bowl. 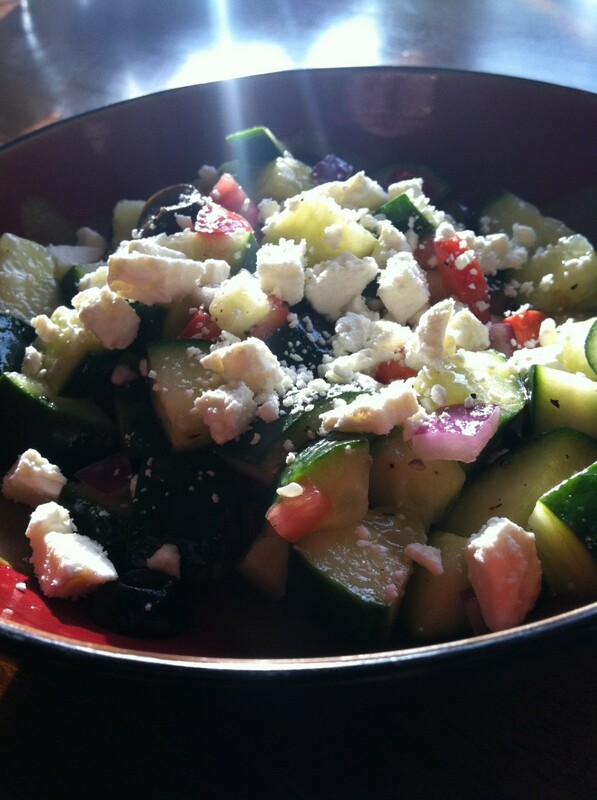 Add tomatoes, cucumber, olives,onion, and feta. Toss to combine. Serve cold. Store in an airtight container for up to 3 days.